Restores skin’s metabolism of youth. New study reconfirms previous findings. 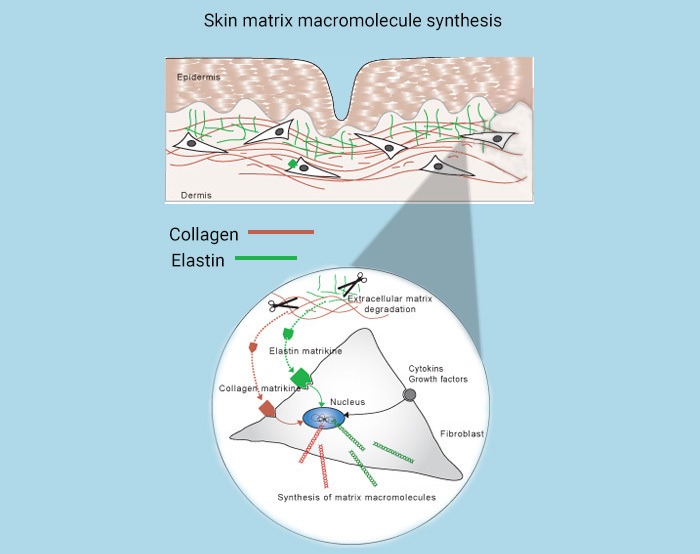 Matrikines anti-wrinkle complex helps reverse the chronological aging as attested by the regulation of senescence markers and reduce the cutaneous photo damage by restructuring the fragile network of the papillary dermis. Matrixyl® has received the in-cosmetics 25 years of Innovation Award in 2015. 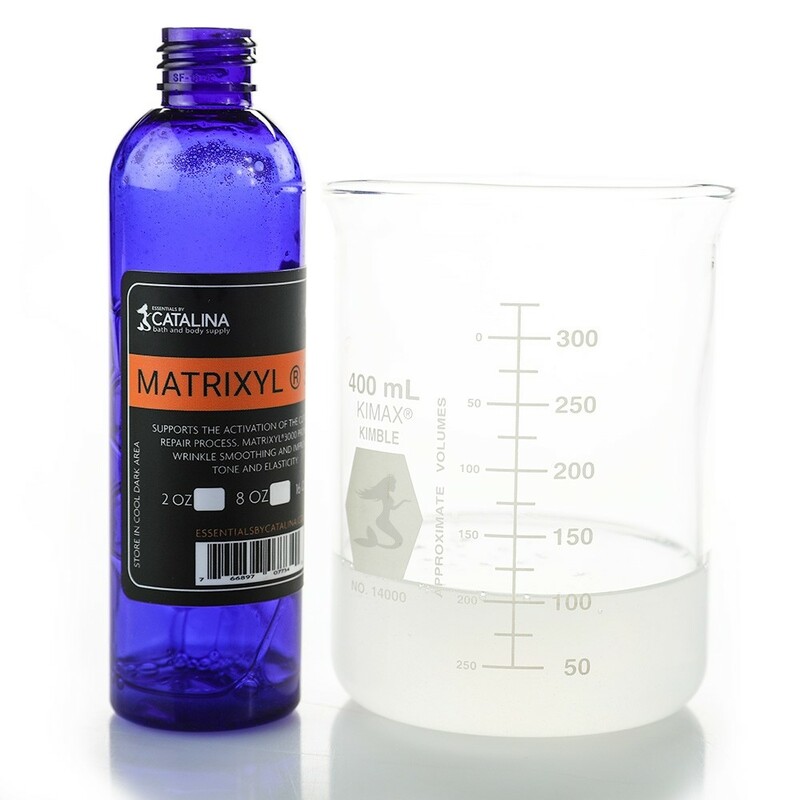 Matrixyl®3000 supports the activation of the cutaneous repair process, and in particular at the level of the fragile and UV-damage prone papillary dermis. Matrixyl®3000 promotes wrinkle smoothing and improves tone and elasticity. Matrikines are messenger peptides capable of regulating cell activities by interacting with their specific receptors. They activate certain genes involved in the process of extracellular matrix renewal and cell proliferation. These mechanisms become weaker and weaker with age. Matrixyl® is a trade mark of Sederma SAS and offered to you at wholesale volume by Essentials by Catalina. It designates an anti-wrinkle active ingredient for cosmetics containing a specific matrikine which cosmetic nomenclature denomination is palmitoyl pentapeptide-4 (palmitoyl pentapeptide-3 before 2006). 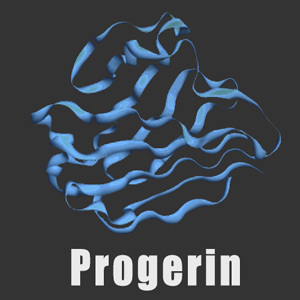 It contains a peptide of 5 aminoacids linked to a 16-carbon chain for improving the penetration of the molecule through the lipidic structures of the skin. Matrikines anti-wrinkle complex helps reverse the chronological aging as evidenced by the regulation of senescence markers and the reduction of the cutaneous photo damage by restructuring the fragile network of the papillary dermis. Matrixyl® has received the in-cosmetics 25 years of Innovation Award in 2015. Matrikine peptides act from the inside to provide long term effects against skin aging. This formulation combines several naturally derived ingredients and compounds for outstanding effectiveness. Formulated with an active, multi-mineral, chrono-energizing blend of Zinc, Copper and Magnesium. This mineral rich mask works synergistically to improve your skin's vitality and also aid as a booster for active ingredients. A luxurious base that gently cleanses the skin. Our Sulfate Free Base is formulated with mild ingredients for all skin types, even sensitive skin. An invigorating blend of natural Botanical Extracts will refresh and tone your skin. The papillary dermis, located just under the dermis/epidermis junction (DEJ), is more fragile than the reticular dermis and is intensely affected by photo aging. Papillary fibroblasts are fundamental to promote epidermal morphogenesis and wound healing that is why papillary dermis repair delivers visible anti-wrinkle benefits. In vivo studies have revealed the positive matrix reinforcing effect of Matrixyl® 3000 by measuring the SLEB density (Subepidermal Low Echogenic Band that corresponds to the papillary dermis). 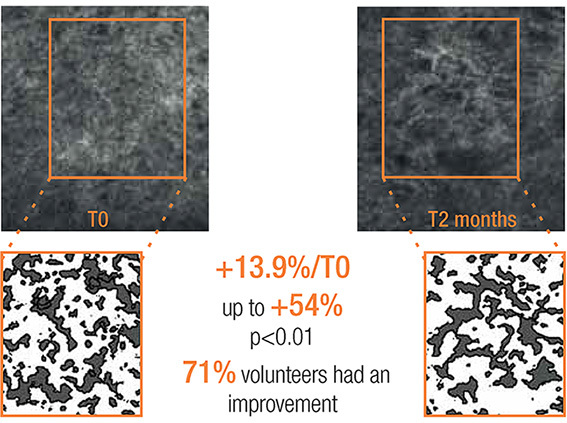 A significant improvement corresponding to a gain in age of 1.8 years is visible in just one month, and confirmed after 2 months: the photo-induced aging is then delayed by 5.5 years. A complementary approach is confirming Matrixyl® 3000’s repairing effect of the cutaneous damages of aging. Now it is its ability to reverse chronological aging that has been demonstrated with both in vitro and ex vivo studies. 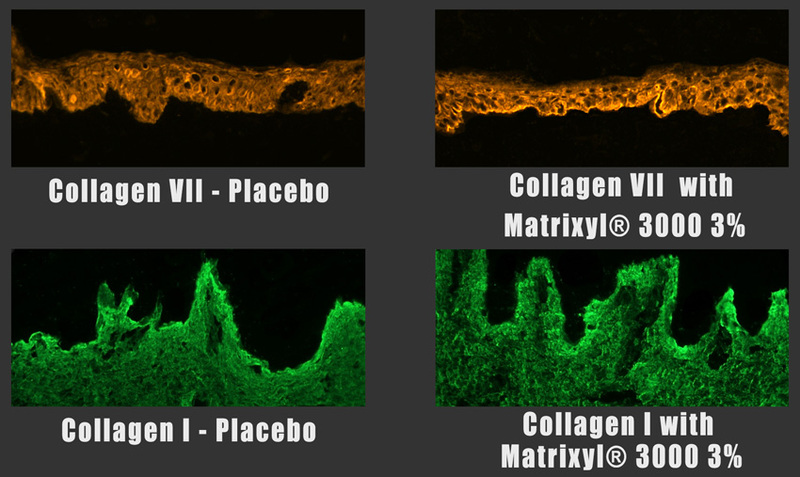 Then, immunohistochemistry analysis of skin sections (ex vivo study) has proved that Matrixyl® 3000 significantly stimulates synthesis of Collagen-I, -IV, -VII, -XVII and Nidogen-I proteins. While these proteins of the dermis and dermal-epidermal junction usually decrease with age, Matrixyl® 3000 rejuvenates the dermal structure and tends to make aging skin behave like young skin. 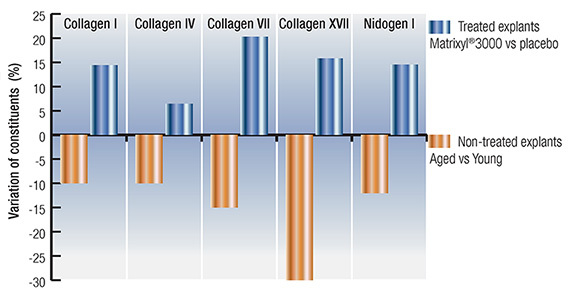 Quantiﬁcation of constituent, anchorage and cohesion proteins of the dermis and dermal-epidermal junction on skin explants (n=10, from 30 to 66 years). 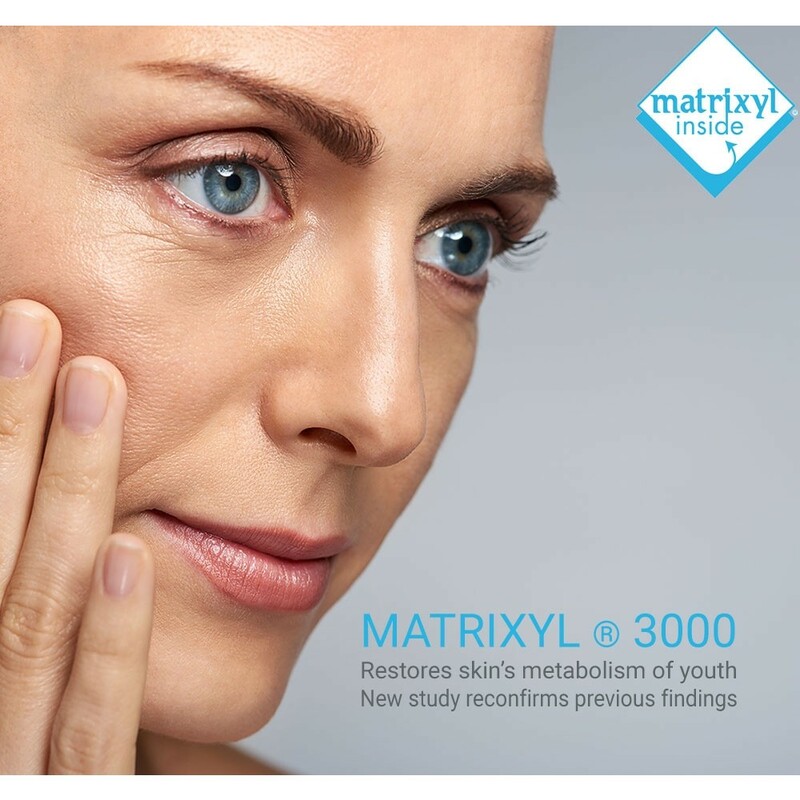 With Matrixyl®3000, aging skin tends to behave like young skin. 28 female volunteers aged from 51 to 72 years, mean age 59. Twice daily application of a cream containing 3% of Matrixyl®3000 for 2 months to one half of the face and the forearm (inner and UV-exposed outer forearm) against placebo. 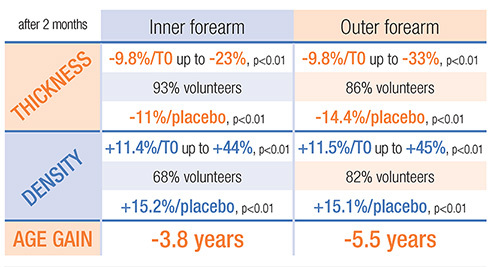 Significant improvement of the SLEB characteristics in just one month (thickness: -5.5%/placebo; density: +7.8%/placebo, on the inner arm) and confirmed after two months. The aging process is slowed downby 1.8 years in just one month. Measurements of the fibre defragmentation by confocal laser microscopy (Vivascope) on the face, next to the external eye corner. Matrixyl®3000 helps reduce the fibre fragmentation and notably supports the reconstruction of the papillary dermal fibre network. 23 female volunteers aged from 42 to 67 years / Twice daily application on one half of the face of a cream containing 3% of Matrixyl®3000 against placebo, for 2 months. 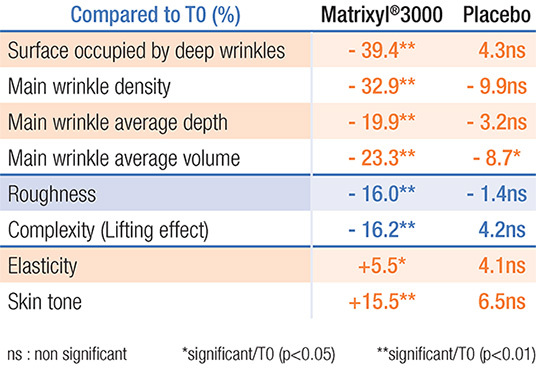 Assessment of the anti-wrinkle efficacy by profilometry, cutometry and photography compared to T0. The repairing effect of Matrixyl®3000 promotes the visible quality of the skin by decreasing the appearance of wrinkles and improving tone and elasticity. 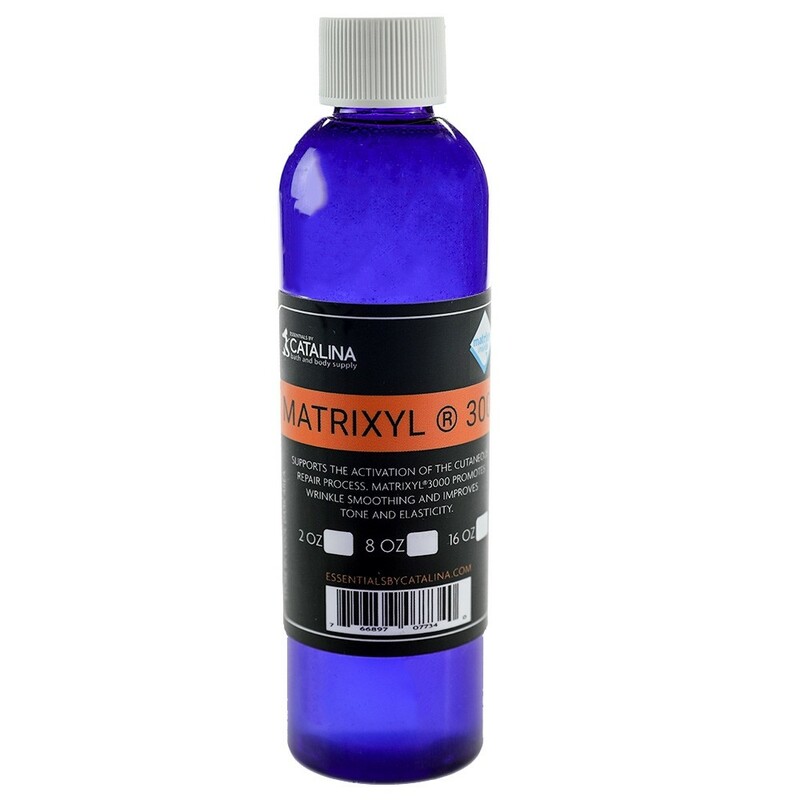 Matrixyl 3000 is an additive that is generally used at 3% in formulations. It will work in the ACE, however most people use this ingredient in formulations that are specifically designed for the face. I've listed a link below to our listing for the Matrixyl 3000 which is filled with useful information, such as use rate, and mixing instructions.